Located in the heart of Glasgow, within the style mile, the beautifully restored Champagne Central has been transformed into a stunning bar. 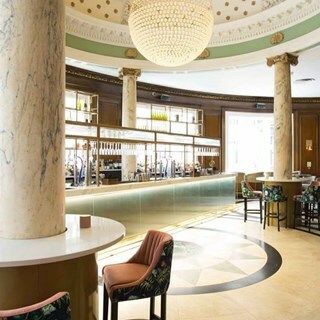 Boasting many original features including pillars, domed ceiling and marble floor, the bar is the most stylish and glamorous place in Glasgow to enjoy a glass of bubbles. With an extensive list of champagnes, fine wines, delicious cocktails and premium drinks and a delicate and sophisticated menu, there is no finer place in Glasgow to enjoy quality food and drink. And with a fabulous view over Central Station it's great for people watching too. Delightful day. Lovely setting and service. The afternoon tea was pleasant and enjoyable. However I found the champagne bar decor somewhat brown dark and boring which makes a heavy atmosphere. More colour would be better. The service was pleasant except that the waitress carried out one of my pet hates. That is, my husband finished eating before me. The waitress came along and cleared his plate etc whilst I was actually still eating.I always find this rude  - as though it is a hint that I should leave - we were well within the table back time limit. The time to clear plates is when the whole party have finished. I usually leave a  tip for good service but not here. Having booked an afternoon tea for 6 to celebrate by mums 80th we had an unfortunate start to our celebrations. One of my aunts tripped up on a protruding brass floor plate which is located at the base of each door. The sole of her shoe ripped off on the protruding plate and she hit the marble ground heavily tearing the skin in various places on her arm and landed heavily in her hip. The manager in duty was superb springing into action placing our party in a private area, administered first aid and took charge of a very upsetting incident. He immediately secured the offending area and the handyman made it safe for other guests- it was extremely busy as there was also a wedding in. He sent out a receptionist to buy my elderly aunt new shoes and gave her slippers till they arrived. He was most attentive and calmed the rest of my elderly party who were quite distressed. I must ask you to thank him for his care and attention which occurred through no fault of our own but due to this raised brass plate. Visited with my mum for afternoon tea. Beautiful hotel and wonderful service will definitely be back again soon. Overall, the experience was okay but just not as good as expected. We booked the private room at champagne corner. There was no one available at reception to show us upstairs so I had to find a staff member at the bar to ask about setting the room up. I then had to come and ask a staff member to take a drinks order. Our server started at 2 and she was great from then on but clearly busy in other parts if the bar. The afternoon tea was really not up to standard, the bread was stale and sandwiches/ wraps did not taste fresh. We asked for a no cream afternoon tea and when this came the options included a jammie dodger and gingerbread man! As I have said overall it was fine, but better quality afternoon teas can be found around the city, I wouldnt rush back im afraid. Service was really good and the food was lovely. The only disappointing thing was the amount of sandwiches or lack of as it really wasn't enough. Experience was good though. Offering similar deals, this far exceeds them. Everything excellent from start to finish. Staff were very pleasant and efficient. Prosecco a little overpriced for 125ml. Lovely atmosphere, staff couldn't have been more attentive. I will be back. If you are looking to treat yourself or someone special then couldn't recommend this place highly enough. Service was shocking! Sandwich choice was pretty poor and sandwiches were dry with no butter. Bread was curling at the corners and too bad if you didn't like sponge cake! I had to explain our dietary requirements as your staff failed to ask! No fish for one,no mustard for another  not too much to ask but still didn't get it right. I complained and sandwiches were taken away to bring us fresh ones. But after a long wait and no actual tea served from us arriving at 12.20 for our 12.30 booking to leaving in disgust at 1.40pm, your staff seemed more interested in wedding arrangements than on your other guests. Thankfully I hadn't pre-paid. My sister and I were treating our other sister for her 60 th Birthday and felt so badly let down, having to leave and find another venue on such a busy Mother's Day weekend was trying to say the least. Staff are all very pleasant. Food was lovely and fresh. The staff were not attentive and busy chatting. Waited a while to be seen initially and to get the bill although the waitress seen us looking over she ignored. The atmosphere, food and drinks were brilliant, but the service was extremely poor. It was very much a case of being seated, food given to us after a wait, and then forgotten about. We were never approached for further drinks or service. Staff were scarce or nowhere to be seen. And when we finally managed to flag down a waitress and ask for our remaining cakes to be boxed we were once again forgotten about. Fifteen minutes later we then had to ask another member of staff if we could have our cakes from wherever they had been taken, and wait a further five minutes for these. Maybe this was just an off day, but definitely disappointing service. Service excellent on our last visit and we were served by Lizzie. Extra tea and coffee offered and all staff attentive. Service was very poor and after some 10 mins sitting had to request a drink  which was proseco served with the afternoon tea . Was informed by the waitress there was a queue for drinks ! Then pointed out that several people had came in after us and were being served drinks ! Had intended to order glass of wine also but was put off by the bar man and the waitress just ignoring us . We were offere another glass of proseco due to our wait which we declined . The food and the tea was very good .